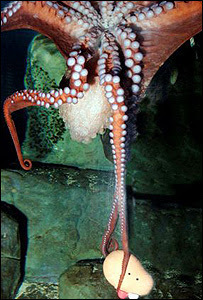 Louis is an eighteen-month-old giant Pacific octopus. Mr. Potato Head is a plastic vegetable who enjoys dressing up. Who'd have thought they'd end up best friends? When Louis recently took up residence at an English aquarium, scientists at the facility worried that he might get a little bored. Octopi, you see, are extremely intelligent creatures, and their curiosity must be constantly stimulated if they're to remain happy and healthy. So the scientists decided to introduce Louis to Mr. Potato Head. Now the two play together for hours at a time, and Louis can get quite testy when it's time for Mr. Potato Head to leave. Of course their friendship isn't hurt by the fact that the scientists use the secret compartment inside Mr. 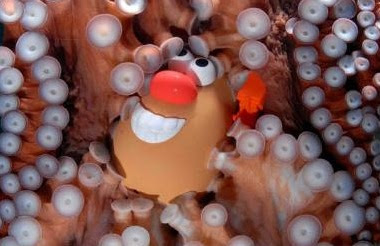 Potato Head to hide special treats, like fresh crab meat. But there's no reason to tell Mr. Potato Head that. creeeeeeeeeepy. that is so out there :) I love this site! This is definitely on the more interesting side of stories of unlikely animal companions,but what would happen if you gave him a Barbie? Theatre: Have you been somewhere fascinating again?